Objects of this type represent all that is known about a certain piece of data that could act as the value of some property. 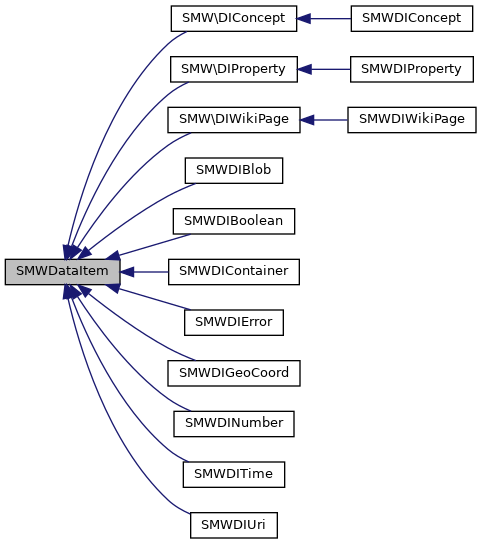 Data items only represent the stored data, and are thus at the core of SMW's data model. Data items are always immutable, i.e. they must not be changed after creation (and this is mostly enforced by the API with some minor exceptions). The set of available data items is fixed and cannot be extended. These are the kinds of information that SMW can process. Their concrete use and handling might depend on the context in which they are used. In particular, property values may be influences by settings made for their property. This aspect, however, is not part of the data item API. Gets the class name of the data item that has the provided type id. Convenience method that returns a constant that defines the concrete class that implements this data item. Used to switch when processing data items. Get a hash string for this data item. Might be overwritten in subclasses to obtain shorter or more efficient hashes. Get a UTF-8 encoded string serialization of this data item. The serialisation should be concise and need not be pretty, but it must allow unserialization. Each subclass of SMWDataItem implements a static method doUnserialize() for this purpose. Return a value that can be used for sorting data of this type. If the data is of a numerical type, the sorting must be done in numerical order. If the data is a string, the data must be sorted alphabetically. Every data item returns a sort key, even if there is no natural linear order for the type. SMW must order listed data in some way in any case. If there is a natural order (e.g. for Booleans where false < true), then the sortkey must agree with this order (e.g. for Booleans where false maps to 0, and true maps to 1). Wiki pages are a special case in SMW. They are ordered by a sortkey that is assigned to them as a property value. When pages are sorted, this data should be used if possible. Create a data item that represents the sortkey, i.e. either an SMWDIBlob or an SMWDINumber. For efficiency, these subclasses overwrite this method to return themselves. Create a data item of the given dataitem ID based on the the provided serialization string and (optional) typeid.